Diggin Deep is one of those games where you make you work for your money. 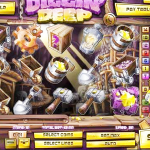 Released in 2012 by Rival this is literally a mining game where you will have to dig really deep to earn your money. Sounds hard right? Well actually it isn’t. with plenty of bonus features Rival is making the job much easier for you. There are certainly many reasons for you to dig and the deeper the better! Like mentioned before there are plenty of bonus features. The wild card is the Gold Miner. It appears on reels 1,3 and 5 and expands vertically to complete winning combinations. There are two scatters in this game. The Gear symbol will trigger free spins. When you land 3, 4 or 5 you will win 10, 25 and 50 free spins with 3x multiplier! The other scatter is the Gold Bar symbol. Three or more will trigger the bonus round allowing you the opportuniyu to dig for more coins! The Crate symbol is the Pick-A-Prize bonus. When you land 3 or more of each anywhere on the reels you’ll get the opportunity to choose a crate full of coins! Other than that hope you get lucky and meet some trolls because 5 of those will make you very happy landing the jackpot prize at 1000 coins. 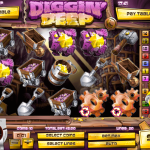 Diggin Deep is a very nice game but the jackpot is smaller than other similar games. This doesn’t mean that you should not give it a try! The game has many bonus features that will guarantee you will enjoy and see a nice return on your money. Really like digging for money? Try playing Diamonds Downunder a 5 reel slot by Rival.